The Government of Sudan is involved in several non-international armed conflicts (NIACs) against a number of armed groups in Darfur, Kordofan and Blue Nile states. 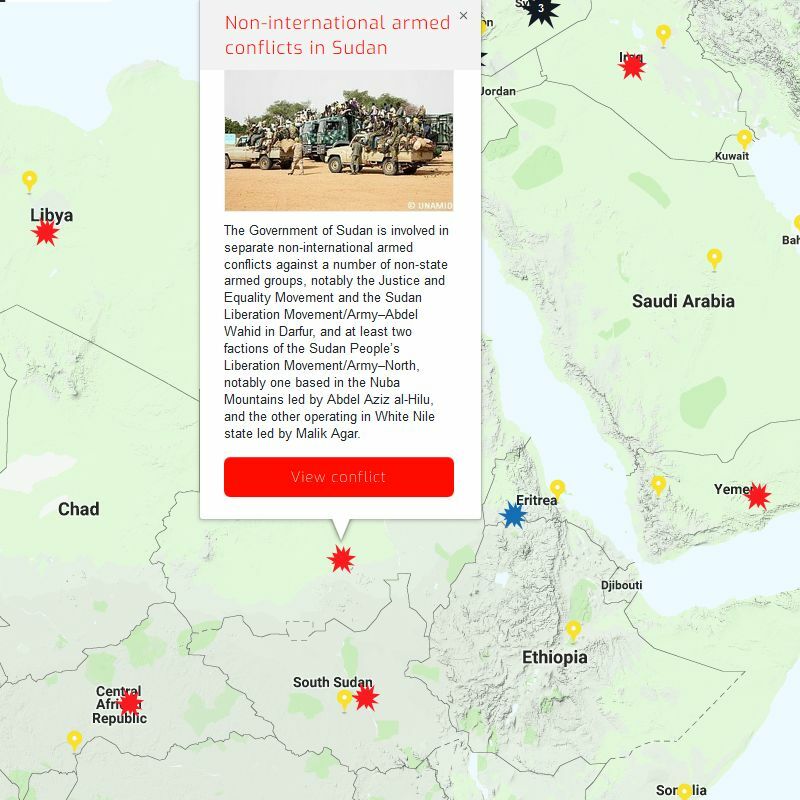 In addition, there is also a NIAC between two factions of the Sudan People’s Liberation Movement/Army-North – one based in the Nuba Mountains and led by Abdel Aziz al-Hilu and the other operating in White Nile state and led by Malik Agar.Our Rule of Law in Armed Conflict (RULAC) online portal provides a detailed analysis and legal classification of these various NIACs and information about parties to these conflicts. Fighting in Darfur broke out in 2003 when a number of armed groups, in particular, the Justice and Equality Movement (JEM) and the Sudan Liberation Movement/Army-Abdel Wahid (SLM/A-AW), took up arms in order to obtain greater autonomy. Since then, fighting has continued despite several ceasefire agreements. In 2018, armed violence between the Government of Sudan and these two armed groups has reduced significantly and on 6 December 2018, the JEM and the government signed a pre-negotiation agreement in which they declared that peace negotiations will resume in Doha over the following months. ‘The existence of a ceasefire agreement does not in itself put an end to a NIAC: violence frequently continues after the conclusion of such agreements and a NIAC only ends in the case of a lasting cessation of armed confrontations without real risk of resumption’ explains Dr Chiara Redaelli, Research Fellow at the Geneva Academy. ‘Similarly, a decrease of the intensity of violence does not imply that international humanitarian law (IHL) ceases to be applicable. Indeed, a NIAC continues until a peaceful settlement is achieved and, accordingly, IHL continues to be applicable regardless of the oscillating intensity of violence’ underlines Dr Chiara Redaelli. The United Nations-African Union Hybrid Operation in Darfur (UNAMID) is operating in Darfur since 2007 to protect civilians, deliver humanitarian assistance and conduct mediation between the Government of Sudan and a number of armed groups. From October 2017, UNAMID started to scale down. Notably, it handed over the Eid Al Fursan, Tulus and Forobaranga team sites to the Sudanese Government. In 2018, the operation continued to reduce its presence in Darfur. However, it still holds bases in regions where the rebels maintain their stronghold and where access to the civilian population has proved more challenging. ‘We concluded, in light of the reduced nature of this peacekeeping operation and the low degree of violence with armed groups that UNAMID is not a party to the Conflict’ stresses Dr Redaelli. Several armed groups are currently active in Kordofan and Blue Nile states. Among them, the most prominent is the Sudan People’s Liberation Movement/Army–North (SPLM/A–N), which splintered into two factions: one led by Abdel Aziz al-Hilu (SPLM/A–N Hilu) and based in the Nuba Mountains; the other led by Malik Agar (SPLM/A–N Agar) and based in White Nile state. While these two factions and the government have declared unilateral ceasefires, the armed violence has not decreased. ‘While we lack clear information regarding the internal structure of these two factions, their organization can be deduced from other elements, such as their military capabilities, their capacity to speak with one voice and to conclude and implement ceasefire agreements’ underlines Dr Redaelli. ‘On this basis, we concluded that they meet the organization threshold to qualify the armed violence between the government of Sudan and these two factions, as well as between these two factions as NIACs’ she adds.